Stuttering is highly variable and is likely to occur more frequently in some situations (eg speaking in front of the class, speaking under pressure, speaking on the phone) than in others (eg talking to a pet, reciting memorised lines). Stuttering is a disorder that can have a great impact upon a person’s life. A child who stutters may become anxious and self conscious about their speech and choose to avoid speaking in certain situations rather than risk a possible event of stuttering. This can put great limitations on the child and their ability to interact with people. Stuttering may become harder to treat with age, so it is important to start therapy as soon as possible. 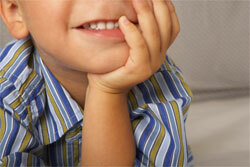 Stuttering often begins between the ages of 2 and 5 and early treatment is always best. Don’t wait for your child to ‘grow out of it’ – seek advice from a speech pathologist as soon as possible. An assessment (evaluation) to determine whether your child is stuttering, how frequently he or she stutters and the types of stutters that are occurring. A report to give you information and a summary of your child’s stuttering. This is often useful information for your child’s Child Care Centre, Kindy or School teacher to have. Information about stuttering and what you can do at home (and what your teacher can do at school) to help. Age-appropriate therapy to help your child overcome their stutter and regain control of their speech. Activities for home or school practice to help your child meet his or her goals.